SAVE MONEY ON THIS GYMNASTICS SPECIAL DEAL!! This comprehensive three-video set is a must-have resource for both female and male gymnasts and coaches at any level. The program provides personal lessons from World Champion and a three-time Olympic medalist, Paul Hamm. The video set is designed to teach the essential skills, drills and progressions for floor exercise and vault. Paul starts with the basics and then moves on to more advanced and elite level gymnastics. Paul shares with you all of the tips and tricks that helped him become one of the top gymnasts in the world. Another feature of this DVD set is detailed video analysis, using voice over, drawing tools and slow motion. This method of teaching is extremely beneficial and will help you develop a deeper understanding of the complicated techniques in gymnastics. Running time - 4 hours 30 minutes. Paul Hamm is the most accomplished male gymnast in the United States history. He has a total of eight World and Olympic medals. In 2003, Paul became a World All-Around Champion and also a World Champion on the Floor Exercise. In the 2004 Athens Olympics, Paul became the first American to win the coveted All-Around gold medal. Paul has spent his life dedicated to mastering the complicated techniques in gymnastics. He has coached all levels from beginner to elite. Paul was quoted as saying, “The use of technology and video analysis was a tremendous tool that greatly benefited my training.” Paul now coaches gymnasts throughout the country utilizing state of the art video analysis technology. Gold Medal Gymnastics Drills video Set Gold Medal Gymnastics Drills: Bars This is volume one of a comprehensive four-part gymnastics program featuring Amanda Borden. In this DVD, Amanda takes her team through a wide variety of progressive drills for the uneven parallel bars. Among the topics covered are: body positions, casting, glides and glide kips, front hip circle, shoot throughs, squat ons, Underswings, tap swings, Flyaway, clear hip circles, baby giants, full giant circles, straddle backs and Pirouettes. An excellent resource for coaches, parents, and gymnasts. 47 minutes. Gold Medal Gymnastics Drills: Beam This is volume two of a comprehensive four-part gymnastics program featuring Amanda Borden. In this DVD, Amanda takes her team through a wide variety of progressive drills for the balance beam. Among the topics covered are: beam complex, balance fundamentals, handstands, jump drills, leap drills, turn drills, cartwheels, level six skills, beam tumbling, back handsprings, connected series and dismount series. A must have resource for coaches, parents and gymnasts. 65 minutes. Gold Medal Gymnastics Drills: Floor This is volume three of a comprehensive four-part gymnastics program featuring Amanda Borden. In this DVD, Amanda takes her team through a wide variety of progressive drills for the floor exercise event. Among the topics covered are: floor complex, back extension roll, front limber, round offs, back handsprings, flipping, tumbling drills, twisting and front tumbling. An excellent resource for coaches, parents and gymnasts. 55 minutes. Gold Medal Gymnastics Drills: Vault This is volume four of a comprehensive four-part gymnastics program featuring Amanda Borden. 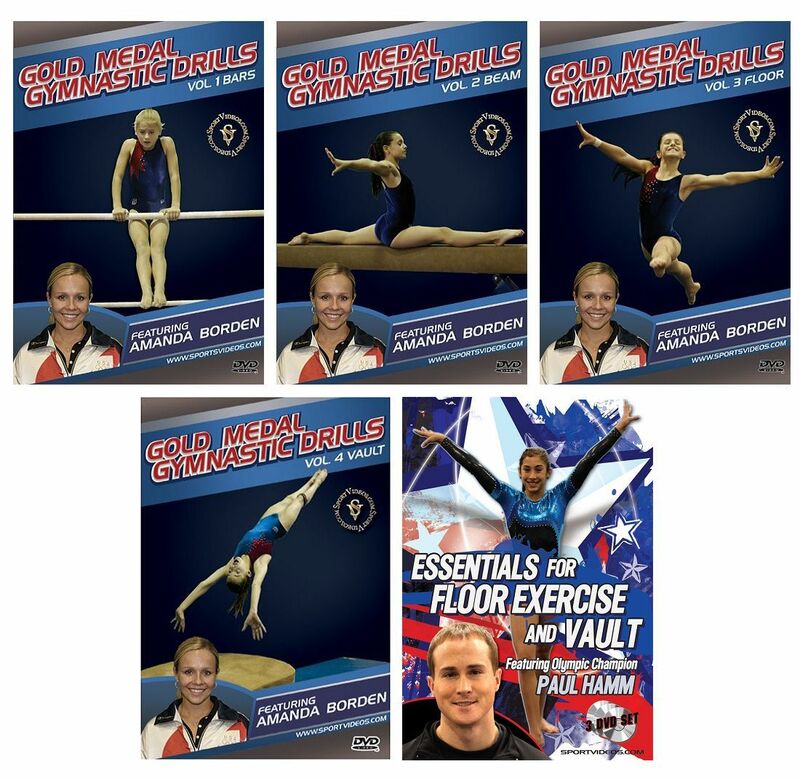 In this DVD, Amanda takes her team through a wide variety of progressive drills for the vault. Among the topics covered are: plyometric drills, speed drills, running drills, hurdles, board position, heel drive, blocking, the Tsukahara vault and the Yerchenko vault. An excellent resource for coaches, parents and gymnasts. 49 minutes.